Your cabin or home will arrive at your location as pre-assembled modules. Each module is typically very large and there must be adequate room for the modules and the truck. The machinery used is custom-built and very maneuverable. It is rare that a building cannot reach its intended location after some trimming of trees, but there are limits. 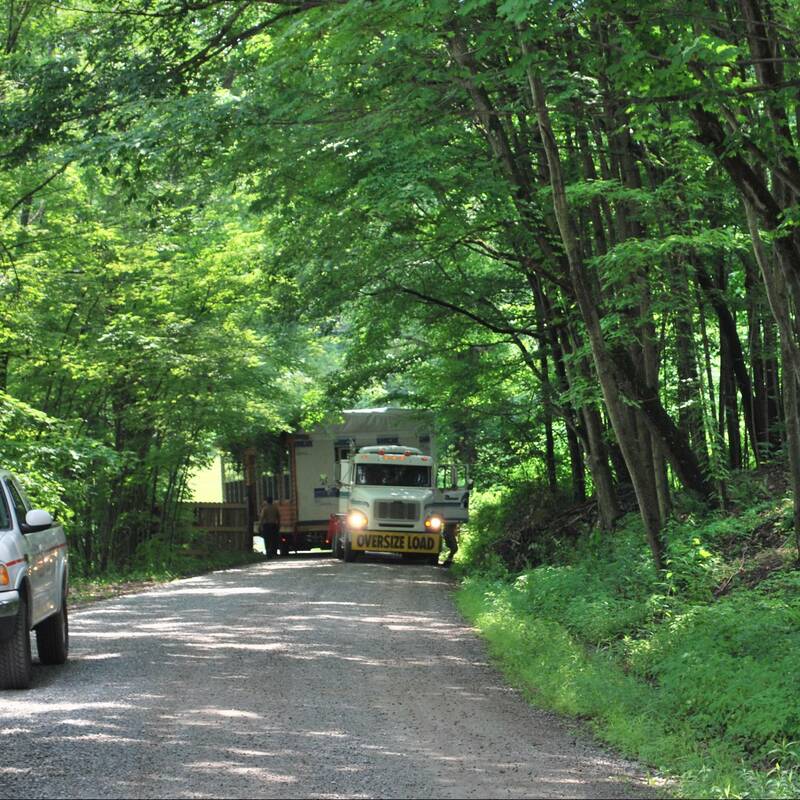 A Cozy Cabins representative will check your job site prior to delivery to make sure the site is indeed accessible. Your driveway must be stoned in and/or free of all mud/sogginess at the time of delivery. Make sure straight sections of your driveway are clear at least 2’ wider than the width of the modules and at least 14’ high. Turns in the access driveway must provide sufficient space to maneuver. An area approximately 40 feet by 40 feet must be provided next to the foundation for the crane to set up. This area must be completely clear overhead, including tree limbs and power lines, and must be on a decently level grade. Our modular log cabins and homes are typically installed on a crawl space foundation or full basement. This portion of the project is completed using the local contractor you choose. When you are satisfied with your design and are ready to proceed with the order we will provide you with detailed foundation dimensions, showing the foundation size as well as proper placement for piers & girders to support the porch & deck areas. This information provides your foundation contractor the all important dimensions he needs to create a full foundation design and a satisfactory footing and foundation system for your new cabin or home. 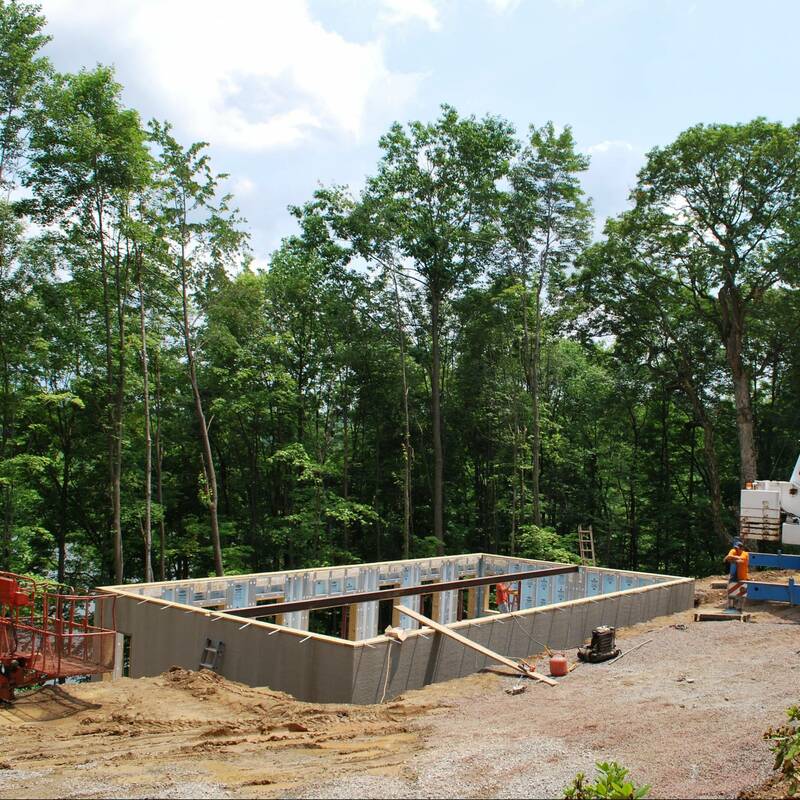 When our crew arrives to install and complete your cabin they will expect the foundation to be complete, with girders and sill plates already installed. For full basements, typically use a central steel I-beam to keep the amount of needed support columns to a minimum. This will also need to be in place before the big day. The installation crew will use a crane to lift your house modules onto the foundation. They will then fasten the modules together, and secure them to your sill plates.